The sun’s out, (some of the time) and it’s mating season. This can only mean the layers are coming off and the legs are coming out! As a pale skinned redhead I dread this time of year as it means I have to up my beauty routine ten fold to keep up with everybody else. One thing I always stock up on is a good exfoliator to scrape away my scales and prep my skin for the dreaded tanning regime of summer. 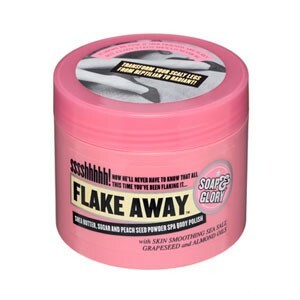 Something I always buy in bulk is ‘Flake Away’ exfoliator from Soap and Glory. It’s great value at £6.50 for a big tub and you don’t need much of it for it to really work. Not only does it come in a pretty pink tub, but also smells delicious as it’s made from Sea Salt, Grapeseed, Almond Oils, Shea Butter, Sugar and Peach Seed Powder. Mmmmm. Putting a handful of it on for the first time and massaging it in, it really feels like it getting rid of all the horrible dead skin that has a habit of sticking around for most of winter. It’s pretty grainy but after washing it off and drying myself thoroughly, it feels like I am wearing a new suit of magic soft skin. It was SO soft, my fella (without a prompt!) even noticed a difference – and he never even notices when I’ve had my hair cut! This is a product I always use before applying my tinted body lotion and so far, I haven’t found anything that comes close to even replicating the silky soft feeling I get afterwards. You can buy this from any Boots store and it’s a great idea if you want something quite heavy duty to get rid of all your lumps and bumps!